← How Big is the Carbon Cycle? We think of ourselves as finely tuned orchestras of cells. We have brain cells to make us smart, liver cells to buffer our indulgences, and immune cells to fight off invaders. These cells are US. They have our uniquely human DNA. They are rather large cells as cells go, and wherever we go, they go. Well, we are crusty critters. 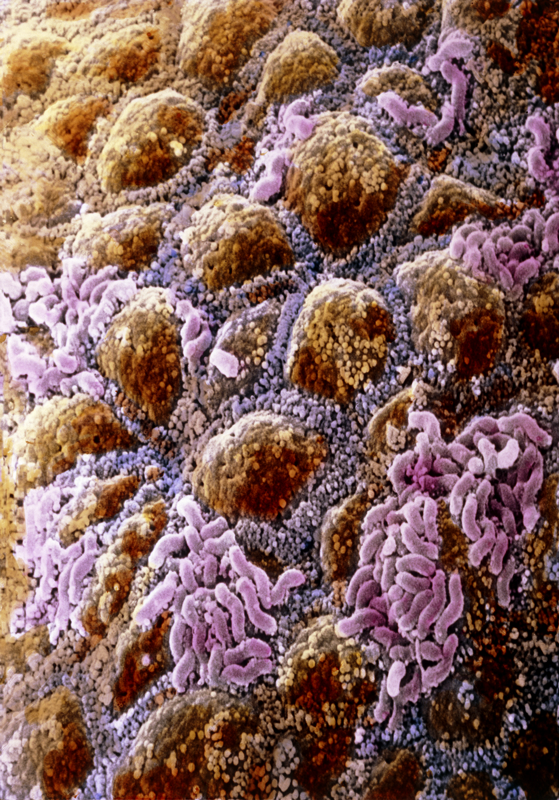 Our guts and skin are barnacled reefs of bacteria like the micrograph below (credit unavailable). Turns out between the reefs and the plankton floating in our body fluids only about ten percent of the cells that go where we go are human. The big ones are human. Those bacteria are tiny little guys that rack up big numbers. They might amount to a couple quarts of our total volume. Do we own them? Do we want to? The other 90 percent of our biome, the microbial dark matter, is small compared to us. We think of ourselves as denizens of a rational universe that obeys physical laws our brilliant predecessors have discovered. It is an harmonic music of spheres with finely tuned motions we can predict with astonishing accuracy. Well, there is this problem with “dark” energy and matter that together comprise an unlit 95 percent of the universe. It does not go where we go. We go where it goes. it is very, very…Very large compared to us and our toy music box of understanding. Between owning merely 10 percent of the cell nuclei in and about our bodies and understanding merely 5 percent of the universe, microbial (and other) dark matter and energy seemingly leave us in Plato’s cave. The other 90 (or 95) percent gives us crusty critters plenty of food for thought. This entry was posted in Biology, Climate, Microbial Dark Matter. Bookmark the permalink.